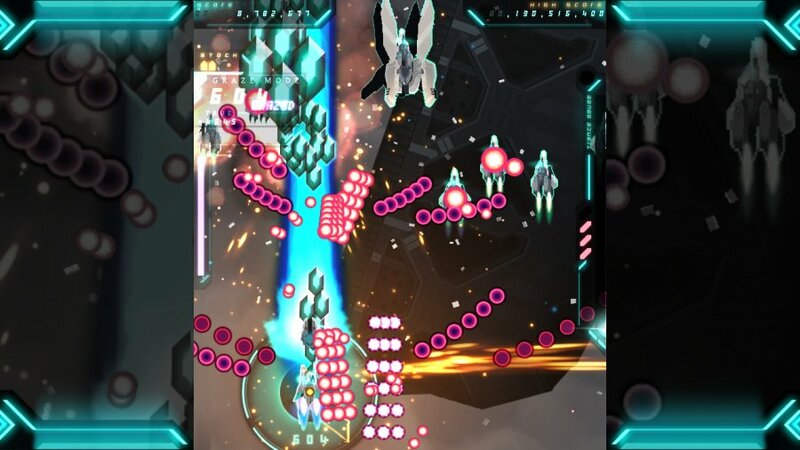 You know a game that calls itself ‘Danmaku’ (Japanese for ‘barrage’) must have some true credentials within the bullet hell shmup variant. Such is indeed the case with this third edition of the series that is now making its way to Switch after gathering some stellar praise from both press and players on PC and mobile. Newcomers to the genre need not worry, despite the superhuman reflexes needed to tackle the game, people without them can still enjoy this title thanks to some useful, casual-friendly features. The game mechanics are quite simple: You need not worry about power-ups to upgrade your firepower, you simply pick your drone formation type and focused fire type and you’re good to go. There are a few unlockable variants for both weapon types that require you to achieve certain feats in-game, offering replay value besides topping your last high score. The ‘A’ button will fire your regular shot while pressing ‘X’ at the same time will focus your drones fire into a single, high-power beam. The trade-off is that while you're focusing your beam, your ship moves at half-speed. Learning how to juggle both firepower and speed is the essential skill that will lead you to successfully navigate the game’s five levels. There are two distinct features that are eloquently explained in the game’s quick tutorial: ‘Spirit Bullets’ and ‘Grazing’. As expected, it won’t take much time to have the entire screen filled with enemy bullet patterns but if you destroy an enemy, their bullets change colour to aqua blue and are harmless to your ship. Collecting these will slowly fill up your Spirit meter. ‘Grazing’ ups the risk-reward factor considerably since it requires you to fly as close as possible to enemy live beams or bullets to fill your Grazing meter. 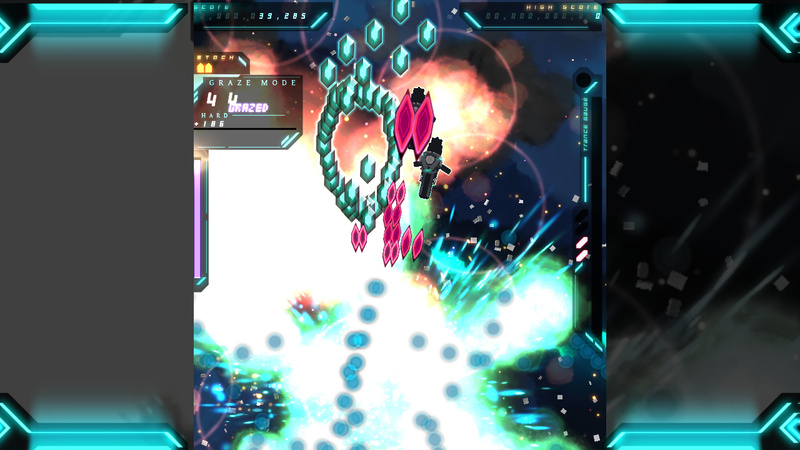 Once filled your ship enters a temporary ‘Trance’ state; Not only will your beams turn gold and do extra damage, destroyed foes drop diamonds that will help you score sky rocket. Bombs are the last trick in your arsenal, limited and deployable with a press of the ‘B’ button. These last resort weapons will not only clear about 50% of the screen of enemies starting at the centre of your ship, but they'll turn enemy bullets caught in the blast radius into harmless Spirit ones. You can even set them to automatic so that they deploy as soon as one bullet is about to hit the core of your ship, essentially acting as life-saving, last second deployable shields, leaving you in one piece to continue the fight. A very nice touch. The game manages to hold an impressively stable 60 frames-per-second on all levels in both docked and portable mode, no small feat considering the relentless barrage of light being throw around. Enemies and their bullets come in different shapes and sizes, along with huge, multi-part bosses fights at the end of each level. Considering the relatively small TATE layout you may fear to become overwhelmed by the levels of action going on the screen, but cleverly implemented game design means this is not the case. Enemy weaponry is coloured using distinctive red hues so that you can always tell which parts of the screen are the least safe. Proportionally, light blue hues are used for Spirit Bullets and thus, safe areas. Despite your ship size, the only single point you need to focus on is the blinking yellow light that at the centre of your ship's frame. We find ourselves more than once completely assaulted by the spectacle of screen-filling chain explosions where we can't even see our ship, but we can always spot that blinking yellow light and navigate it among maze-like enemy bullet patterns to safety. Those expecting the usual electronic soundtrack will be surprised to know that the game music is composed by Japanese indie band Blankfield so hard rock is on the menu this time. The distorted guitar riffs fit in perfectly with the action, rounding up the aural experience nicely with the already brilliant visual one. 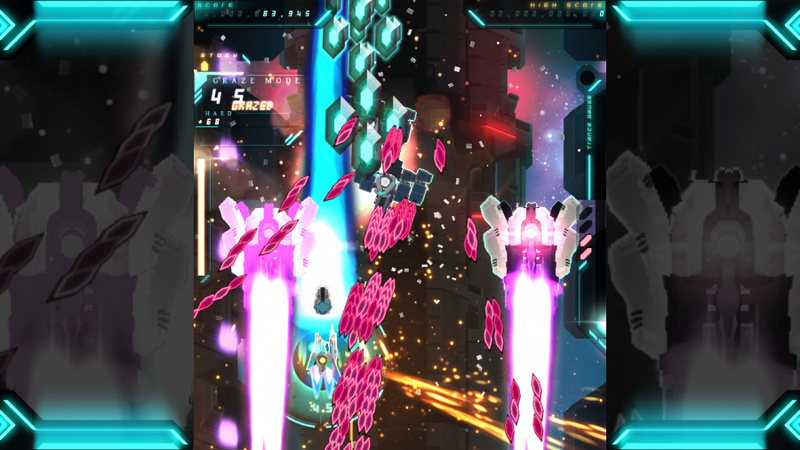 Most bullet hell shmups only have one difficulty: the extremely hard variant. But as we previously mentioned, Danmaku Unlimited 3 might be one of the best examples of a customisable experience within the genre, leaving the choice of mission difficulty up to the player. Bonus modes enable you to tackle boss rush in order to better perfect your strategies dealing with these behemoths or play the whole thing with unlimited continues, ensuring that anyone can experience the entirety of the game they paid for. We could be picky and criticise the lack of a two-player mode, but we believe the whole game was tailor made to have a single-player controlled ship of enormous firepower on screen so implementing a second one would probably require a hefty redesign. This one is for lone pilots only. Day 1 purchase for me. Now we need folders for the OS for categories. I knew you were a big fan of this, you've had it for a while now as well. But the best shoot-em-up on Switch? You've now just made the wait for it to appear on the US Eshop even longer. Going to use my hard earned gold coins on this beauty. I didn't want to just spend them on anything,wanted my 'free' game to be a special one and this is that game. Great review man! Needs a video to show it in motion. It reminds me of Ikaruga which is a great thing. This is the sort of review I expected...which is this game is awesome! Looking forward to trying it out. The Switch is a shmupper’s paradise! Yowsers! Was anticipating a positive review but this was evangelical. 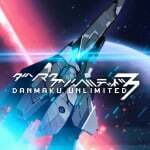 Best Shmup on Switch?! That's some serious praise. Can you hear this CAVE? Come on now and bring all your bullets to this growing Switch shooters heaven. I have DU2 on my phone and its a dream to play on that. I can only imagine how much better it is with real controls. I guess i can stop imagining soon! Yep, Danmaku Unlimited 3 is really amazing. Funny how this got released so shortly after we got an announcement of the Switch getting a version of Psyvariar. The Psyvariar games were among the first that introduced the "graze" gameplay mechanic which Danmaku Unlimeted uses so excellently. With the amount of shmups the switch is getting Tate mode would be a godsend. The little thing is just built for it. @OGGamer Danmaku supports TATE mode, as do all the PSIKYO shooters and certain Arcade Archives releases like Heroic Episode and Starforce. The Hamster releases aren't as straightforward as clicking 'change screen orientation', they need flipped then stretched but it's there. Playing these classics with the console sitting vertically in a stand is a thing of beauty. In the absence of the holy grail of schmups, Sin & Punishment 2, perhaps I can settle for this. @JaxonH I just started playing it half an hour ago. It's spectacular, I've never played anything like it.it looks and sounds incredible too . You'll be happy to have this one your Switch, for sure. That's 3 modern shoot-em-ups in as many weeks and every one of them are brilliant and offer totally different experiences. SkyForce Reloaded, Steredenn: Binary Stars and now Danmaku 3. All highly recommended. TATE mode is what sold me on this game. That is such a huge and useful feature of the Switch. Really makes Switch the best place to play shmups, outside of an actual arcade cabinet. Only a matter of time before a third party company releases an mini arcade cabinet for the Switch, a la iCade. I'm going to download this and rub my Switch all over my body. I am not the biggest shmup fan to be sure. But I do play them from time to time. With such a rave review and low pricetag, I might have to give this one a go. That sub-heading really threw me off for a moment.. I hope LR do a physical at some point, on any platform. Its so deserved. Wow, I wasn't too sure about this one but it looks like a good one! Really enjoying this game but why no online leaderboards ? I'm sure it's fine. Can't get these bullet densities anywhere else on the Switch yet. Sold! Get back here wallet! Wait! Not one person moaning about switch getting and port of iOS game. @OorWullie Well, I've got two of the three already so I guess I'll need to find those extra pennies, lol! Totally gonna buy this tonight when I get home from work. Is it €10? Can't see Euro price on the site here, just Dollar. @Ryu_Niiyama what's the release date for taiko? 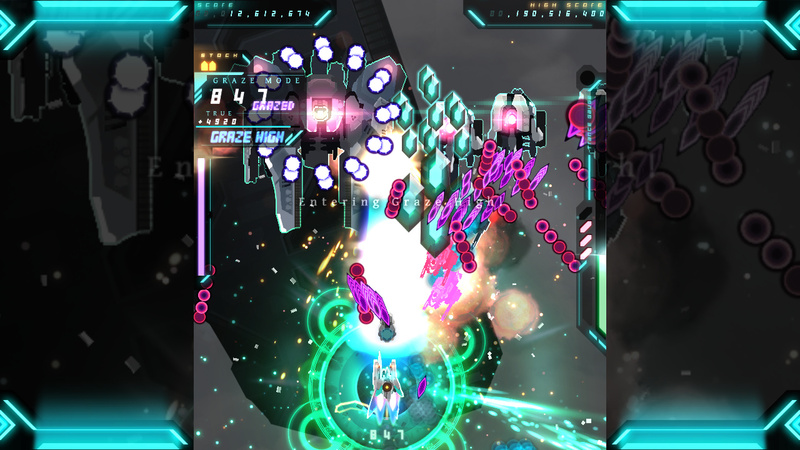 "Every other shmup on the system now feels slow and dull in comparison." Please note I made this comment before the release of Steredenn: Binary Stars. Buy them both. I go deep on bullet hell games, this is solid. Does this game come with a vertical screen mode? Can't really tell from the review or comments. And I'd still very much like it if you would consider adding file size to the info box for eShop games. @kobashi100 "summer" according to the direct. @JaxonH That's one game I'm NEVER EVER getting rid of. My WiiU stays alive for Sin and Punishment 2 and Tatsunoko vs Capcom. Having played it briefly last night it definitely is fun and runs silky smooth but the overall visual design is a little lacking; never liked the somewhat “virtual Tron look”. Also all the bullets and beams block the backgrounds and enemy designs. I know this is common among bullet hell games but its an even bigger issue here. @FX102A I'd agree with that. Hopefully it'll grow on me as otherwise solid. I think at this point it does not really need to get mentioned anymore because pretty much any game on the Switch that could need a vertical (TATE) screen mode supports it (DU3, Strikers 1945 I&II, Gunbird, Gunbarich, Samurai Aces, Star Force, Heroic Episode, Zombie Gold Rush, Namco Museum, Pinball FX3, even the puzzle game in the Mutant Mudds collection). The only Switch game i know where vertical screen rotation would be useful that does not suppport it is Stern's Pinball. Really enjoying this game, can get very intense. Playing this makes me think of how great Cave shumps would be on the Switch, I’d love to see DodonPachi, Death Smiles and Bug Princess. I did message the developer but got no reply. @darthstuey When you go to purchase a game off the store it gives you the option to put a set amount or all of your gold coins towards the purchase. You can check there without actually making the purchase or take a look at your MyNintendo account online. Bought this yesterday. Do not delay. Buy today!